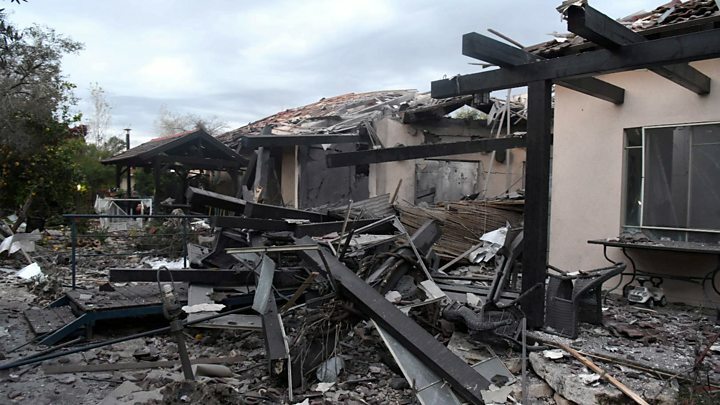 Seven people have been injured after a rocket fired from the Gaza Strip hit a house belonging to a British-Israeli family in central Israel. The rocket came down at 05:25 (03:25 GMT) in the community of Mishmeret, 20km (12 miles) north of Tel Aviv. Prime Minister Benjamin Netanyahu cut short a trip to the US over the attack and vowed to respond with force. So far no-one has said they carried out the attack. The Israeli military accused the militant group Hamas, which controls Gaza, but a Hamas official said it had "no interest" in doing so. The house belonged to Robert and Susan Wolf, two British-Israeli dual nationals who are originally from London. Mr Wolf told the Daily Telegraph newspaper that he had been at home with his wife, son, daughter-in-law and grandchildren when the rocket hit. "If we hadn't got to the bomb shelter in time I would be burying all my family," he said. Although the rocket triggered sirens in the Sharon and Emek Hefer regions, Israel's Iron Dome missile defence system was not activated. When asked for an explanation, an IDF spokesman told the Yedioth Ahronoth newspaper: "Iron Dome protects the areas in which it is stationed, according to operational situation assessments." Intended to combat missiles launched from ranges of between 40km and 70km, each Iron Dome battery can protect an area of roughly 155 sq km. But the BBC's defence correspondent Jonathan Marcus says there is a limited number of batteries available and they need to be deployed correctly to meet the most likely threats. The failure to intercept this missile, he adds, is a reminder of the altogether greater challenge should Israel be engaged in a conflict on its northern borders, where the volume of Iranian and Hezbollah missiles might swamp its defensive systems. IDF spokeswoman Major Mika Lifshitz blamed Hamas, which has fought three wars with Israel since 2008. "It's a Hamas rocket, itself made by Hamas," she said. "It has an ability to reach more than 120km." The Israeli authorities have also closed the Kerem Shalom and Erez border crossings with Gaza, and closed roads and suspended agricultural work near the boundary fence with Gaza. The British ambassador to Israel, David Quarrey, said there could "be no justification of any kind for this attack". Jason Greenblatt, the US special representative for international negotiations, wrote on Twitter: "We condemn this violence from Gaza and affirm Israel's right to defend itself." Hamas has not commented on the attack publicly, but an unnamed official told AFP news agency that "no-one from the resistance movements, including Hamas, has an interest in firing rockets from the Gaza Strip towards the enemy". The Times of Israel reported that the Hamas-run interior ministry in Gaza had launched an investigation to determine who was behind the rocket launch. Islamic Jihad, another militant group, warned Israel against retaliatory strikes. "[Its] leaders must know that we will respond forcefully to their aggression," he said.